For more than 30 years, Frank Leta Acura has been serving the automotive needs of drivers in Chesterfield, Ballwin, Kirkwood, Webster Groves, Town and Country, and beyond. We have been able to cultivate a loyal and enthusiastic base of customers by providing an exceptional dealership experience every time. We simply do more to ensure you’re satisfied. When you buy a new Acura or a quality pre-owned model, you know you’re getting the absolute lowest price up front. You’re also entitled to a lifetime of free car washes, free roadside assistance, and lots of other perks. Our financing process is accessible to all and a lot more convenient than what you might be accustomed to. Plus, taking care of maintenance and repairs is a breeze when you rely on our professional service center and expert team of technicians. And when you need parts, find all the official Acura parts and accessories you need to create the car of your dreams. We invite you to visit us in person and put our commitment to excellence to the test. Work with our no-pressure sales staff, and discover just how much our dealership has to offer. We have a feeling you’ll be impressed. Then keep us in mind the next time you need sales, financing, service, or parts. The entire Frank Leta team is eager to meet all of your automotive needs! 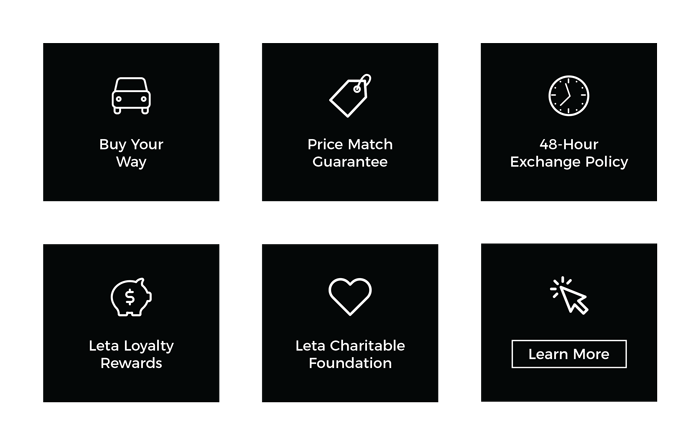 We established the Leta Charitable Foundation to deliver on our mission to positively impact the community. We raise money for our foundation by organizing an annual fundraising golf event called The Leta Classic, as well as donating 10% of our company profits each year. Additionally, we donate $2 for each service appointment scheduled online to a select charity each month. We are proud to support our partner charities and hope that our assistance allows them to continue making a difference in the St. Louis area.